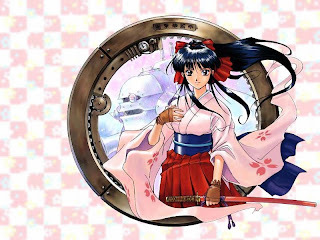 The Sakura Wars RPG debuted back in 1996, and has spawned anime, manga, novels, models, figures, toys, a dedicated gift store, a café, musicals, and a movie. 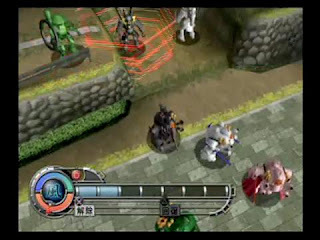 The game is half tactical RPG and half dating sim, with a storyline set in a steampunk version of Taishō era Japan involving the conflict between the bishoujo of the Imperial Assault Force in their Koubu (Spirit Armor), and the power armored demons of the Black Sanctum Council. Pro-Hobby (Icom) released a set of diecast 1/60 scale Koubu of the Imperial Assault Force in 2004. It was a rather strange move, since the Sakura Wars franchise didn't have a place in Pro-Hobby's extensive line of 1/144 military and N-scale train products. Four Koubu were produced (starting with product code 003, so at least two others were probably in the works) but the complete set was never finished. I'm guessing that at ¥3,500 each, they were too pricy for most collectors. I picked up Sakura's Koubu when they first came out, and only recently purchased two additional Koubu at a much lower price. Despite their scale and the dimensions given in Sakura Wars Steam Military Factory, I think these 1/60 Koubu look pretty good with 1/72 figures. In my opinion, the look next to 1/72 figures is fairly consistent with the appearance of the Koubu in the manga and anime. From left to right are Sakura's Koubu (PROPT-003), Iris's Koubu (PROPT-004), and Kanna's Koubu (PROPT-006). There is an additional black Koubu for Maria (PROPT-005). The Koubu are brightly colored, and resemble members of a super sentai team more than military vehicles. However, given that they fight demons from the netherworld there's not much to say about the appropriateness of the colors, though Sakura's pink Koubu and Iris's Koubu with a bow tied in the rear are particularly cute. If I ever get any more of these models, I'll paint them olive green as shown at the 統合軍造兵 Arsenal. 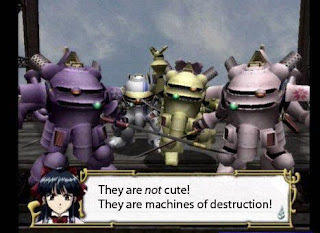 As a side note, after almost a decade and a half, the first translated version of a Sakura Wars game - Sakura Wars V ~ So Long, My Love - will make its appearance in North America. I think the game was initially announced by NIS for late 2009, but it has now moved to early 2010. Versions will be made for PS2 and Wii platforms.